The plantar fascia is a ligament that runs from the bottom of the heel to the ball of the foot. When the plantar fascia becomes inflamed and painful it is called plantar fasciitis. 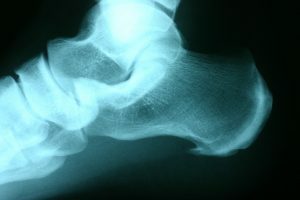 This condition may have a painful bony spur at the bottom of the heel associated with it. Most patients complain of pain when first weight bearing in the morning after getting out of bed. Long term heel spur and plantar fasciitis can cause pain at night and sleep disturbance.